Click chart above for a ffull size printable version. By: William Robert Helms Jr.
A lot of people say that Donald Trump doesn’t have the temperament to be President but he is the President. Perhaps some insight into who he is would help. Without going into a full reading of his natal chart let’s look at some of the highlights, and let’s start at the very top of his chart. There we find Uranus in his tenth house of profession. Uranus is our planet of eccentricity. Uranus is where we can see farther than most people. He thinks he can see farther and more clearly than anyone else. With Uranus at the top of his chart he will always be unconventional. He has always had an unusual profession. He absolutely will not be held to convention. His Uranus is trine his natal Jupiter, which is in his second house of money. Jupiter’s placement and this trine are excellent for good fortune. 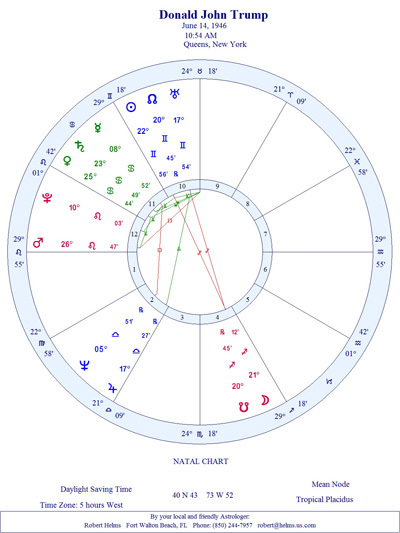 Looking to the left side of his chart we find Mars on his ascendant. The left side of his chart is his personality. Mars is pugilistic, combative, and brash. This explains why his lower lip is protruding so often. He can strike out at you. He will cheerfully fire you. I wonder if he has ever sucker punched anyone before. He is a Gemini which is ruled by Mercury. 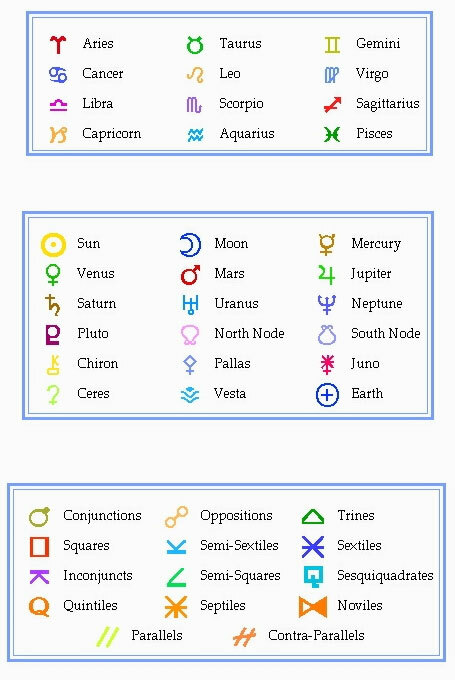 Mercury defines our abilities to communicate and his Mercury is square to his Neptune. A square to Neptune is not what you want here. Neptune is our inspiration and confusion. He has communication issues which can be witnessed in the way he speaks. He rambles and is inconclusive because he doesn’t know when to stop. He needs a good speech class where you are taught that if you have something to say you stand up and say it, then you sit down. He must learn to speak concisely and with brevity. His Saturn is conjunct his Venus. Venus is finances, love (women), and sociability. Saturn is cold, dry, and responsible (restrictive). That cold hard Saturn sitting on his soft warm Venus gives him great responsibility with finances, but on the downside, it also goes far to explain his harsh persona with women. The Mars on his ascendant doesn’t help here at all. Visit the AstrologyParlor Page on Facebook. © Copyright 1996-2016 William Robert Helms Jr. - All rights reserved. This material may not be published, broadcast, rewritten, or redistributed in any way.